Nicole Austin and her lamb docking iron. Massey University industrial design graduate Nicole Austin’s re-modelled lamb docking or tailing iron has won the top prize in the New Zealand section of the James Dyson Award. In the 17 years the award has been run in New Zealand it is the first time a woman has won the award. “It’s pretty exciting. Now that women are becoming more engaged in industrial design, it’s nice to be able to represent that,” Ms Austin says. The global product design competition celebrates, encourages and inspires the next generation of design engineers. Ms Austin’s design, called Moray, helps eliminate repetitive strain injury for farmers when using traditional tools during the seasonal process of removing lambs’ tails – known as docking. The body of the device, which updates equipment unchanged in design for more than 40 years, is made from reinforced nylon and ergonomically designed with a specialized handle to make the docking process easier on the farmers hands. Effective docking significantly reduces lamb mortality and improves the health and productivity of the animals too, she says. 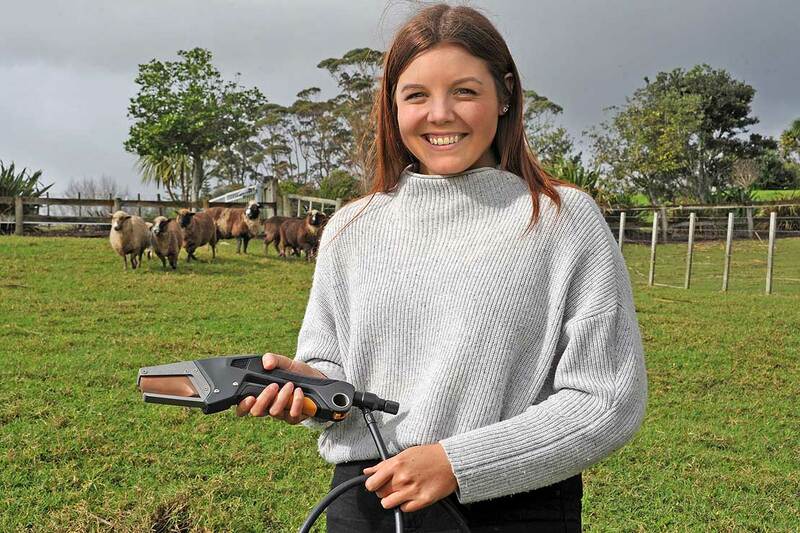 “I’ve refined the tool to be 35 per cent lighter and to use 60 per cent less hand span than the docking iron currently used by New Zealand farmers,” she says. Her design was first exhibited last November at the annual end of year design exhibition Exposure run by Massey’s College of Creative Arts and has led to her securing a full-time job as part of Fisher & Paykel Appliances industrial design team in Auckland. She has also made the device more reliable by using piezoelectric igniting and a specialized double-chamber dampening shaft for reliable weather-proofing and consistent blade temperatures for clean cauterization. Effective docking significantly reduces lamb mortality and improves the health and productivity of the animals too. Ms Austin, who is originally from Timaru, was also pleased to devise a design for the sheep farming sector which in recent years had operated in the shadow of the dairy industry. James Dyson Award New Zealand head judge and president of the Designers Institute, Mike Jensen, says the judging panel was impressed by Ms Austin’s deep exploration into how the product may provide significant improvements for animal welfare and user comfort. “Nicole visited a series of farms to interview farmers, ran surveys and undertook rigorous design workshops during the research phase. She also spent time docking to truly understand the process and the current challenges faced by farmers during the highly labour-intensive docking season. “The result is a prototype design that will save time and definitely effort and is a major advancement on what is currently being used by farmers,” Mr Jensen says. “It’s exciting to see a functional and rugged design that has been well researched and that holds much commercial potential for domestic and international markets. Ms Austin’s award earned her $3500 in prize money. Other finalists included fellow Massey industrial designers who studied at the College of Creative Arts; Glenn Catchpole who made an ecologically designed chair that produced zero waste; Abby Farrow who designed a hand-held device that makes intravenous vein finding easier for medical practitioners and less stressful for patients; and an electronic, tunable and portable log drum for modern musicians designed by Rachael Hall. Auckland University of Technology industrial designer Haydn Jack was also a finalist with his design of a live streaming system specifically designed for amateur sports broadcasters. The New Zealand finalists now progress through to the international final where a prize worth about NZ$50,000 will be awarded to the winner to be announced on October 26. The tertiary institution they represent will also be awarded a prize of NZ$8000.